Spoilt Southern belle, Scarlett O’Hara discovers that boy next door Ashley is to be married to his cousin Melanie, and decides to have a 4 hour tantrum. 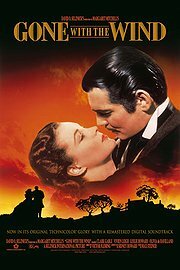 Melanie is of course lovely, Ashley a total wuss, and stranger in town Rhett Butler is bad and dangerous to know, but for some reason likes the conniving and poisonous Scarlett. Whilst the men are away fighting in the Civil War, Scarlett cajoles and bullies her female relatives into keeping the ranch Tara going by doing all the farming and cotton picking. Then on the end of the war, uses Rhett to pay off carpetbaggers who threaten to tax her so much they would lose Tara. However, finally Rhett gets the woman he wants, but of course, she’s still lusting after Ashley, and doing everything she can to disrupt his own marriage. Ok, I know that it was one of the first films to be filmed entirely in colour, that the search for an actress to play Scarlett took years, and that the fire in Atlanta was created by burning most of the sets, but Scarlett O’Hara is so totally unlikeable, and everyone else is too pathetic to do anything about it, that I was desperate for it to end. However, Butterfly McQueen’s squeaky voiced servant Prissy was the highlight, with her comment “I don’t know nothin’ ’bout birthin’ babies!”. I laughed at that, but otherwise, classic film or not, I hope I don’t have to see this again for a long while. This entry was posted in War Films, YearInFilm and tagged 1930s, 5/10, drama, romance, tv, usa. Bookmark the permalink.